Time may be the most effective cure for a hangover. Together with a lot of water and rest. But sometimes, the sorry truth is that we simply don’t have time to sleep (apart from a cheeky five minutes, head drooped on our keyboard, when Colin leaves the office). And well, drinking water can be pretty repetitive, and if you drank Ouzo the night before… pretty lethal. 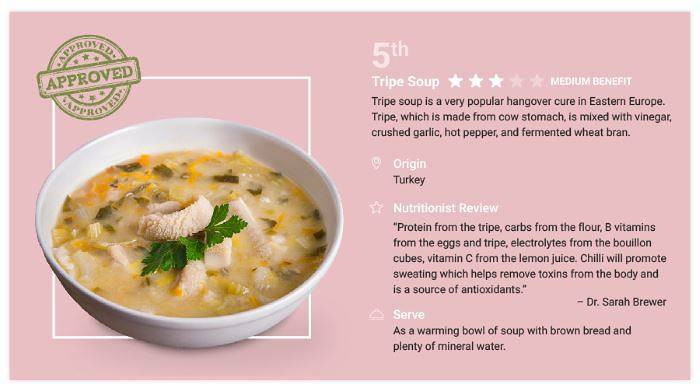 So, if you’re in need of a quick fix and are willing to try anything (like the Italians) then check out some of the best and worst hangover foods from some of our favourite holiday destinations of 2018, ranked by medical nutritionist Dr. Sarah Brewer. Goon may be their tipple of choice, but how do they cure their hangover the next day? 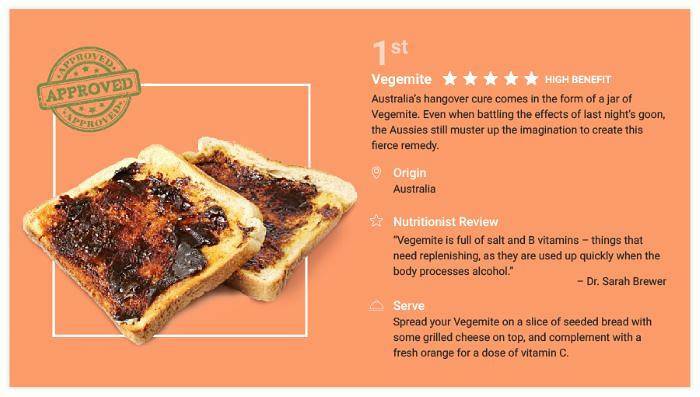 Australia’s vegemite on toast is top of our list for best hangover cures proving that the simpler, the better. The mix of salt and B vitamins will help you back on your feet in no time! “J’ai la gueule de bois“, which translates to “I’ve got a wooden mouth” is how the French exclaim their sorry state the next day. What’s their saving grace then for a dry mouth? 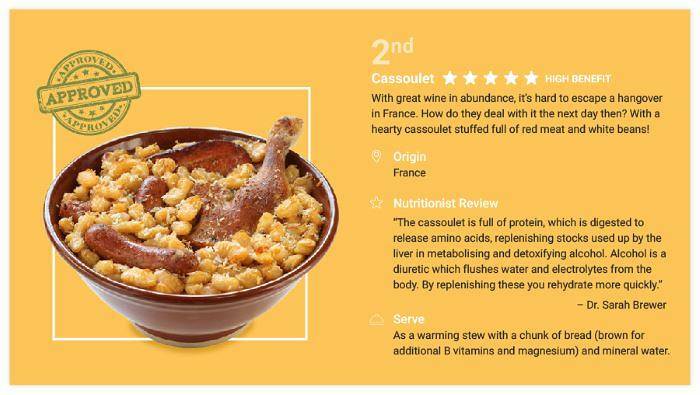 Their labour of love, the cassoulet, of course. It’s stuffed with red meat and white beans, which are great sources of protein. Add some coconut water as an excellent way to rehydrate too, as this provides minerals and electrolytes, helping you beat this hangover once and for all. 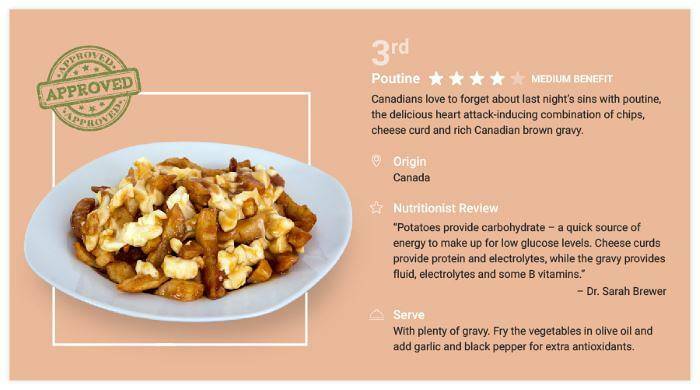 Poutine is probably the most well-known and loved foods of the Canadians, and luckily for us, now a trendy street-food snack here in the UK. 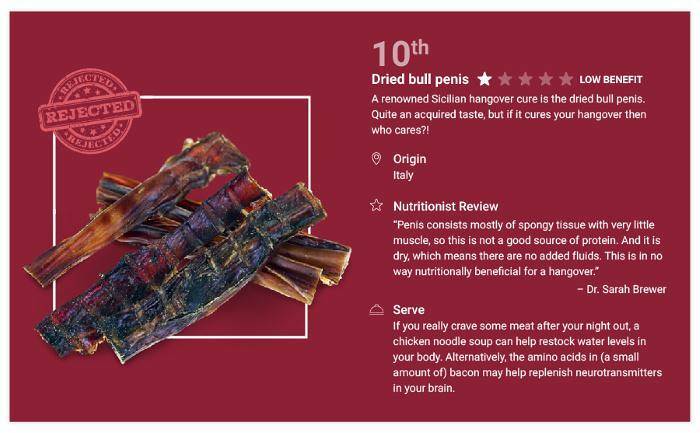 Even better, it also sneaked into our top three hangover cures! 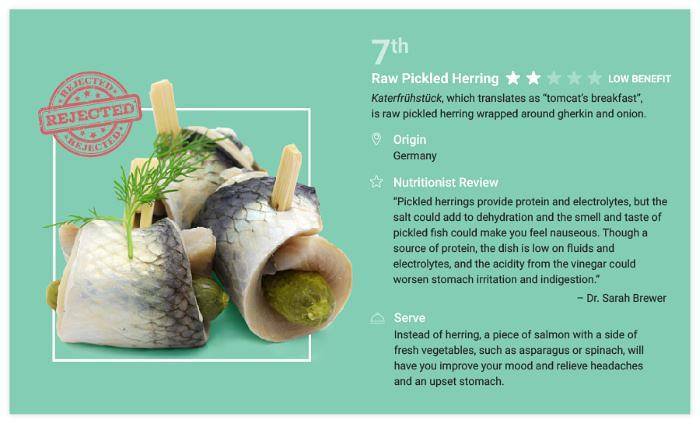 Tasty and effective—winner! Why does it make the cut? Well, excess alcohol causes our glucose levels to dip during the night and morning as the liver is too busy metabolising alcohol. Luckily the potatoes provide plenty of comforting carbohydrates as a quick source of energy. The name for a hangover in the Spanish language is resaca, literally translated as ‘backwash’. Not a pleasant image, we must say, but we’ve all been there. 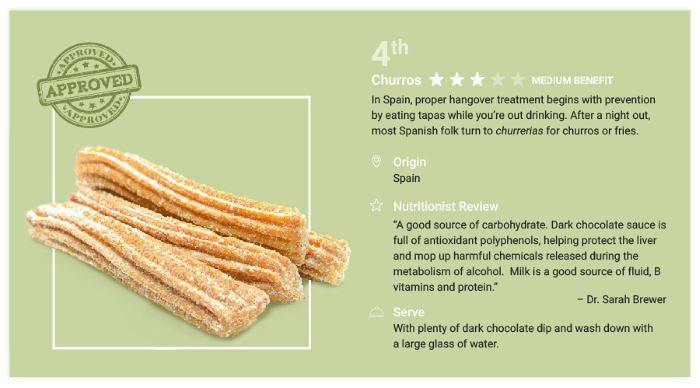 You’ll be glad to hear that we recommend serving your churros with plenty of dark chocolate sauce, and this is very likely to bring you back to normality! Make sure you are eating while you drink — the Spanish try to prevent their hangover by eating tapas, as it may make you feel less intoxicated! Kalıntı, meaning ‘carcass’ or ‘ruins’, is the visceral name with which the Turkish refer to their hangovers. If you feel ‘ruined’, a warm bowl of soup with a chunk of brown bread served with plenty of mineral water might just bring you back to life. If you’re feeling up to the challenge, add a generous portion of chilli, sit back and sweat out last night’s sins. 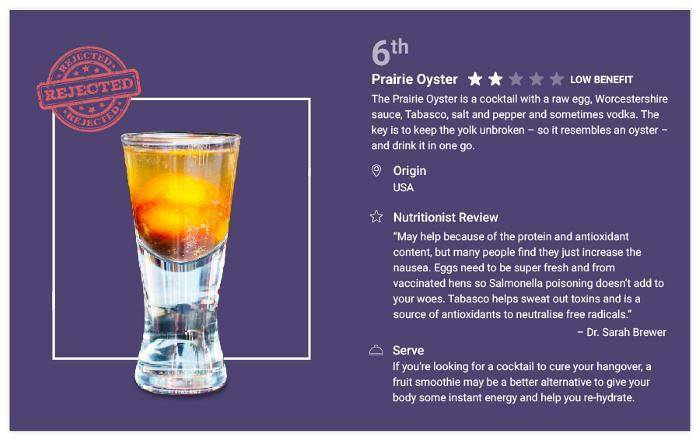 Not a million miles away from the renowned Bloody Mary, the Prairie Oyster is not only drunk as America’s hangover remedy, but it’s also touted as a cure for hiccups! This cocktail of raw egg, Worcestershire sauce, Tabasco, salt and pepper and vodka is another fine example of the hair of the dog tactic that we’ve all tried, but unfortunately it’s not as helpful as we’d have hoped. 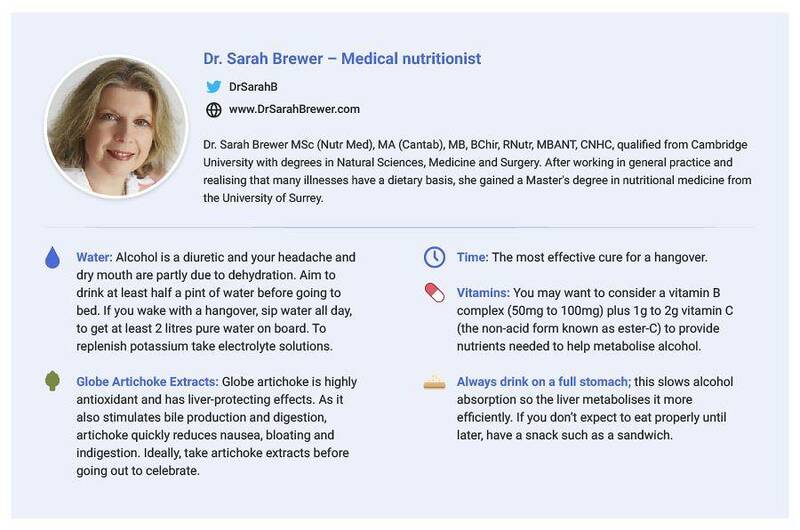 Dr. Sarah Brewer thinks that it may just increase your nausea, especially when you add vodka to it. Best miss this one out! ‘Ich habe einen Kater’. Loosely translated, this means ‘I have a tomcat’, though it likely derives from Katarrh, which is a flu-like symptom. If last night’s drinks have you feeling under the weather, Germany’s answer to this may not be the best cure. The salt could make you more dehydrated, and stomach irritation and indigestion could be worsened. Plus let’s not even mention the stench. 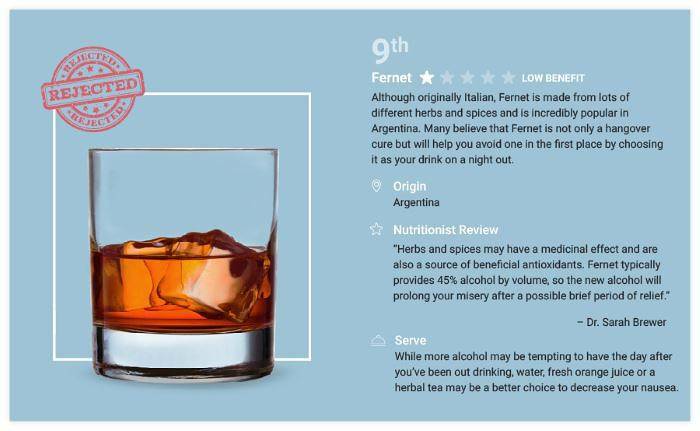 Fernet is a traditional drink in Argentina but originated in Italy. It’s a bitter drink made from herbs and spices and contains 40% alcohol, so may well be the reason they got in this mess in the first place. As much as we’d like to believe that hair of the dog is a legitimate strategy, Dr. Sarah Brewer tells us straight when she points out that ‘we’re only prolonging our misery’. 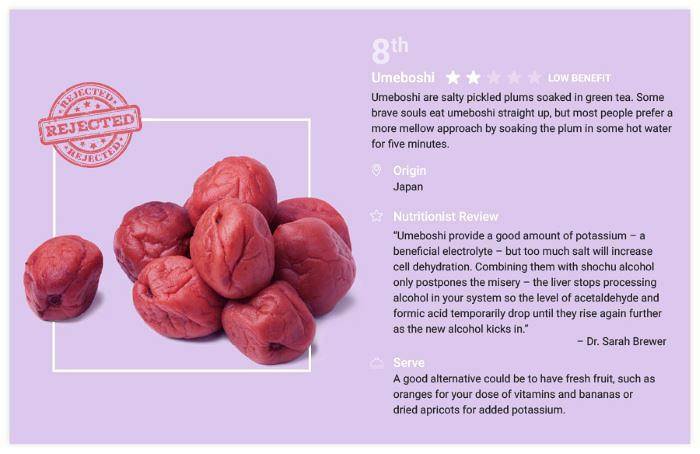 This is because your liver stops processing alcohol already in your system so the level of acetaldehyde and formic acid temporarily drops—until they rise again as the new alcohol metabolites kick in. The science has revealed that the Australians and the French have the best remedy for a hangover, followed by Canada, Spain and Turkey. Unfortunately, the USA, Germany, Argentina and Japan should probably take some lessons from other countries if they want to get rid of their headaches and dry mouth. As for Italy, we’d love to know the logic there! If you’re in doubt, drinking plenty of fluids, taking supplements, eating a light diet and resting until the hangover wears off might be your best bet when you’re travelling to your favourite holiday destination. Then promise yourself never to do it again — just think of your poor liver!